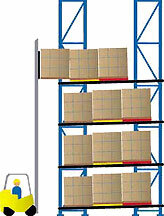 To max out both storage and selectivity, warehouse managers are frequently moving to higher-density storage systems like pushback rack instead of floor stacking or selective racks. Whether a pushback system makes sense for you is something that depends on what you’re storing, how you are accessing it, and what you need to do with it once it’s picked. Pushback rack systems can give you up to 90% more product storage than selective storage rack systems and up to 400% more selectivity than drive-in racking systems. They’re probably the best balance between selectivity and storage density. But proper training is a must to get maximum productivity while keeping your operation safe. Forklift drivers who are used to selective racks will have to change their thinking and upgrade their skills when a dynamic pushback system. Inadequate training can lead to product damage, lost time, and compromised safety. Unlike single-pallet deep selective racks, pushback storage rack systems let you store 2-5 deep pallet layers while providing easy access to a variety of different SKU’s. It’s not as selective as static racks, but the storage density is greatly enhanced. (For a detailed analysis of racking styles and which to use in what situation, see “Selectivity vs. storage density: choosing the right pallet rack style for your application”). “Pushback System Safe Operating Procedures User Handbook,” is a free booklet is being offered by Steel King. This pushback safety handbook highlights best practice procedures, and illustrates them with easy-to-understand graphics. The manual illustrates the best practices from years of experience. It covers the three main points that every forklift driver must master to get the most out of a pushback system: controlling the load when it comes forward; properly positioning pallets; and avoiding ‘cross stacking,’ or the placing of pallets on multiple carts. To get a copy of the handbook, just send us a pushback rack inquiry and it will be shipped to you. In the notes field, ask for the booklet.